How can you communicate cutting edge scientific ideas about the origins of the universe without, actually, using the word ‘universe’? Or ‘particle’? Or ‘planet’? This week, at an event held in London, I had the pleasure to listen to someone who has done exactly that. Dr Roberto Trotta is an astrophysicist from Imperial College, London. In his new book The Edge of the Sky: All You Need to Know About the All-There-Is Dr Trotta uses only the 1000 most common words in the English language, as taken from the British National Corpus, to describe some of the biggest ideas in science. In the simplest of language, the book seeks to explain the deepest workings of the cosmos and the origins of our universe. In total, Trotta uses around 707 of the ‘ten-hundred’ most common English words, although he does sprinkle them with another 19 proper names (of scientists like Einstein, Hubble and Newton). With this limited lexical palette, his writing accentuates a childlike wonder, heightening the deep emotional connection we have with the mystery of our existence. Grand notions like the ‘Milky Way’ become simple metaphors (‘White Road’). Others, like ‘universe’ and ‘Earth’ are redefined, simply and poetically, in their most fundamental terms (‘All-There-Is’ and ‘Home-World’). For me, the most exciting part of his writing is the latter: the necessitated creation of complex concepts from simpler ones by compounding everyday words (‘Student-people’, ‘Home-World’, and so on). As I have blogged about before, there’s something beautiful about such simple acts of creativity (creation?). Perhaps this is because they put us somewhere close to the creator (her- or) himself. The 1000-words premise that Trotta uses may not be entirely new but the book has been – rightly in my view – praised for what it achieves in conveying the near impossible-to-convey. Trotta said during his talk that, as a science communicator, the challenge for him was how to speak to people’s hearts as well as their heads. In just 85 short pages, he does a pretty good job. 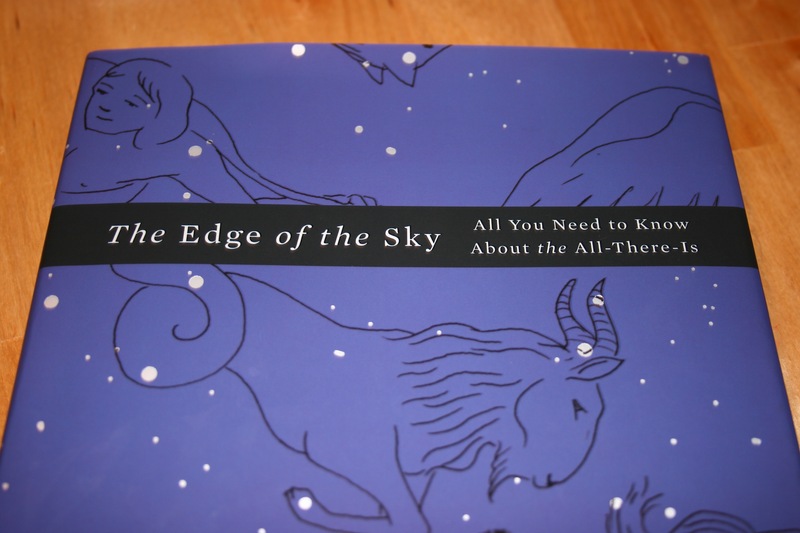 So if you’re looking for a stocking-filler this Christmas, for anyone you know with a sense of wonder, I’d highly recommend The Edge of the Sky. This entry was posted in language, linguistics and tagged astrophysics, language, linguistics, science. Bookmark the permalink. Thank you for sharing this book. I’m currently working as a writing coach for a group of science teachers, and I’ll be buying the book and sharing it with them soon.